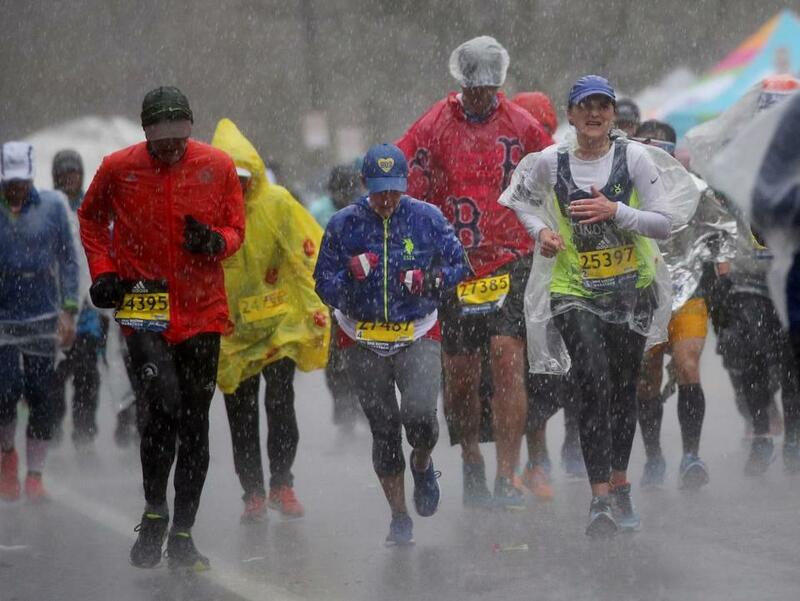 Runners had to deal with cold temperatures and rain throughout last year’s Boston Marathon. The Boston Athletic Association on Friday announced weather-related changes to Monday’s Boston Marathon schedule to ensure the safety of participants, pushing the Wave 4 start time immediately behind Wave 3 (10:50 a.m.). Because the forecast calls for cool morning temperatures and windy and rainy conditions, the BAA eliminated the 25-minute gap between Waves 3 and 4 to reduce the amount of time runners will have to wait at the athletes’ village in Hopkinton. Preparations have been made to ensure the safety of everyone along the route, including accommodations for overflow at medical aid stations, ponchos and hand warmers for volunteers, adjustments to staging areas that include tent walls and heaters, and enhanced gear-check stations. The Boston Marathon has never been canceled or postponed in its 122-year history, although it was stopped in 2013 after two bombs were detonated near the finish. Last year’s marathon also was run in cold, rainy conditions. “The thing about last year is that the conditions weren’t dangerous like 2012 with the heat,” race director Dave McGillivray said. “They were just uncomfortable and miserable. That’s why we weren’t considering cancellation, as we’re not considering it this year. The National Weather Service said a period of showers with embedded heavy rain and possibly thunderstorms will develop Sunday night and continue into Monday afternoon. Around start time, the temperature is expected to be in the upper 40s to 50. Highs Monday afternoon are expected to reach the mid 60s. There is a chance of thunderstorms between 5 a.m. and 3 p.m., according to weather service meteorologist Alan Dunham. The BAA has contingency plans to make sure runners, spectators, and volunteers are prepared to deal with the conditions. “We have operations along the course to communicate with runners and spectators to seek shelter,” said BAA communications manager Meg Reilly. “It depends a lot on the situation. There’s been a number of years where runners have been compelled to remove themselves from the race due to weather. Eligible athletes whose means of participation are directly affected by the conditions, such as wheelchairs or prosthetics, can elect to defer their participation and will be given complimentary entry into the 2020 Boston Marathon, with qualifying standards waived. Martin Finucane of the Globe staff contributed to this report. Dan Shulman can be reached at dan.shulman@globe.com. John Powers can be reached at john.powers@globe.com.